For the photography magazine, see Source (photography magazine). For the bi-monthly published by the John Lewis Partnership, see Source (magazine). For other uses, see The Source (disambiguation)..
"The Source Awards" redirects here. For the episode of 30 Rock, see The Source Awards (30 Rock). 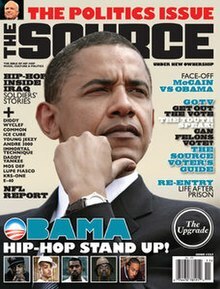 The Source is an American hip hop and entertainment website, and a magazine that publishes annually or semiannually. It is the world's longest-running rap periodical, being founded as a newsletter in 1988. The Source was started by David Mays, a Jewish Harvard University student in Cambridge, Massachusetts. Mays decided to hire his friends, Jonathan Shecter (as Editor-in-Chief), James Bernard (as senior editor) and Ed Young (as associate publisher), and the four men immediately became shareholders in the ownership of the magazine. At the time, Mays handled duties as the publisher for the magazine, and Shecter was the editor-in-chief. The magazine's offices were moved from Massachusetts to New York City in 1990, a move that was made with the intention to expand the magazine into a mainstream market publication. The magazine's annual awards show, known as The Source Awards, honors both hip-hop and R&B performers for their contributions to hip-hop. The Lifetime Achievement Award is the highest award given to an emcee who has contributed his/her time to succeeding in the hip-hop music industry. The Source also releases a compilation album of hip-hop hits. The magazine expanded overseas with a French-language version, alongside The Source Latino and The Source Japan magazine franchises. The company invested in mobile phones and ringtones under The Source Mobile Channel moniker, in which subscribers are offered their favorite choice of hip-hop ringtones. The Source also invested in its own urban clothing apparel company. The Source announced in a press conference that the magazine was in possession of an old tape in which a young Eminem was rapping racial slurs against Black women. For his part, Eminem did not deny making the tapes; he claimed that he made them after a bitter break up with a black girlfriend (a situation upon which he elaborates on "Yellow Brick Road" on his Encore album). He apologized for making the tapes but also exhorted the public to consider the origin of the allegations. Nevertheless, Eminem sued The Source for defamation and copyright infringement. The federal courts ruled in The Source's favor, and allowed a limited distribution of the tape's music and lyrics under Fair Use law. In 2005, after Eminem's motions against The Source were dismissed in federal court, lawyers for Eminem abruptly withdrew his lawsuit against The Source, stating that the rapper no longer had any issue with The Source. Mays and Benzino both countered the withdrawal of the lawsuit, calling it a "cowardly" move. They both claimed they could finally expose the truth about Eminem and planned to eventually release the racist tapes in a future magazine. It devoted its February 2004 issue to the discovery of the tapes, and included a CD of the early Eminem songs with the magazine. Later, Benzino and The Source would urge video and radio stations to ban Eminem's video, "Just Lose It", and issue an apology to Michael Jackson. The video depicts Jackson in a negative light and the publication wanted to boycott the rapper. In spite of their efforts, BET was the only network to ban the video. BET claimed Benzino was not the reason for the banning, but rather that it was out of admiration of Jackson. Eminem released the single "Like Toy Soldiers" from Encore, in which he states he'll "walk away from it all before it gets any further". Benzino responded with the "diss" track, "Look Into My Eyes", in which he claims Eminem does not want to fight anymore because he was "scared". In 2005, after Kimberly Osorio had been unlawfully fired, Mays and Benzino appointed Joshua "Fahiym" Ratcliffe to the E.I.C. post at the publication. That same year he abruptly resigned after he was ordered to lower the rating of Little Brother's The Minstrel Show from four-and-a-half to four. Lil' Kim's release, The Naked Truth, received the five mic rating instead. Although critics speculated that Lil' Kim's manager was dating Dave Mays, this was the first time that a female rapper ever received the highest rating in the magazine. In 2006, Benzino formally announced that he was resigning as chief operations officer and co-owner of The Source, stating that his battle with Eminem and the magazine's publishers were hurting the revenue of The Source. But a few days later, Benzino announced that he had returned to The Source as co-owner. Industry insiders believed that The Source had staged a fake event in order to encourage advertisers to invest in the controversial magazine. The rapper refuted his claims about saving The Source, and instead blamed Interscope's chairman Jimmy Iovine. Benzino believed that Iovine was pressuring to fire rap mogul L.A. Reid if he didn't have Def Jam advertising removed from The Source. The reason why Benzino stepped down was to save Reid's position as president of Island Def Jam, or so he claimed. Benzino then went on radio denouncing Def Jam's founder Russell Simmons for not participating in his smear campaign to antagonize Eminem. He had used racial comments about Simmons in the past, forcing Def Jam to pull a vast majority of their ads from The Source. Later that year, Benzino and David Mays were forced out of The Source by its private-equity investors Black Enterprise / Greenwich Street Corporate Growth Partners. In January 2012, The Source and L. Londell McMillan held a press conference to announce that Kimberly Osorio was returning to the magazine as the Editor-In-Chief and VP of Content and Editorial of the Northstar Group. Her return came over five years after she sued the magazine and its former owners, Dave Mays and Raymond "Benzino" Scott for sexual harassment, gender discrimination, retaliation and defamation. The jury ruled that she was fired without following proper procedures (retaliation) and found that Benzino's public reference to her as trying to "extort" the company was defamatory. In her suit, Osorio claimed that Benzino harassed her and other women on the staff. She also complained that Benzino and his friends were treated more favorably in pay and perks than the females on staff. Her suit also stated that numerous complaints of harassment of female staffers were not followed up on by Mays, Benzino or senior management. Unsigned Hype is a column in The Source devoted to identifying promising new rappers who do not have record deals. Many famous or successful rappers were once featured, including The Notorious B.I.G., Eminem, DMX, Canibus, Immortal Technique, Common, Mobb Deep (appearing as Poetical Prophets), Ya Boy, Joell Ortiz, Proof and Pitbull. More recently, the column has found great success breaking artists such as Kid Ink, Action Bronson, Macklemore, Flatbush Zombies and Trinidad James. The Record Report is a section in the publication in which the magazine's staff rates hip-hop albums. Ratings range from one to five mics, paralleling a typical five-star rating scale. An album that is rated at four-and-a-half or five mics is considered by The Source to be a superior hip hop album. Over the first ten years or so, the heralded five-mic rating only applied to albums that were universally lauded hip hop albums. A total of 45 albums have been awarded five mics; a complete, chronological list is below. Life After Death – The Notorious B.I.G. No One Can Do It Better – The D.O.C. ^ Ogunnaike, Lola (29 January 2003). "War of the Words at Hip-Hop Magazines". The New York Times. Retrieved 2 October 2014. ^ "Eminem Racial Slurs Come Back To Haunt". Chicago Tribune. November 20, 2003. ^ "Just Leave, Ray" (PDF). Bomani Jones (PDF). 2005. Archived from the original (PDF) on 2007-10-23. Retrieved 2009-08-19. ^ "Kim Osorio Returns To The Source Magazine". BET. January 11, 2012. ^ Carlson, Peter (October 25, 2006). "Hip-Hop Editor Wins Suit over Her Firing". The Washington Post. Retrieved May 7, 2010. ^ "Stock quotes, financial tools, news and analysis - MSN Money". ^ Carlson, Peter (25 October 2006). "Hip-Hop Editor Wins Suit Over Her Firing" – via washingtonpost.com. ^ "Entertainment News, Celebrity News, and Arts & Entertainment". ^ Osorio, Kim. "5 Mics: Who Got Next?". The Source. Retrieved 2012-05-14. ^ "5 Mic Albums". The Source. Retrieved 2010-09-15.